This is one of the leg strengthening exercises that strengthens the quadriceps muscles, which are some of the largest muscles in your body. This workout also benefits your buttocks. 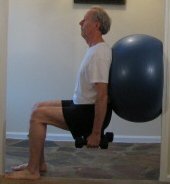 What muscles do this exercise work and strengthen? Strengthening these muscles will help you rise from a chair quickly, and climb stairs easily. It is an excellent leg extension exercise. One of the best leg workouts. Another benefit is that strong quadriceps may prevent "Runner's Knee", which is also known as patellofemoral pain syndrome. According to Dr. Darin Padua in an article titled "Pinpointing the causes of 'runner's knee"", it is stated that weaker quadriceps muscles are 5.5 times more likely to develop "Runner's Knee." However, if you experience back or knee pain or have a back or knee injury, first ask your doctor if this leg exercise is appropriate for you.